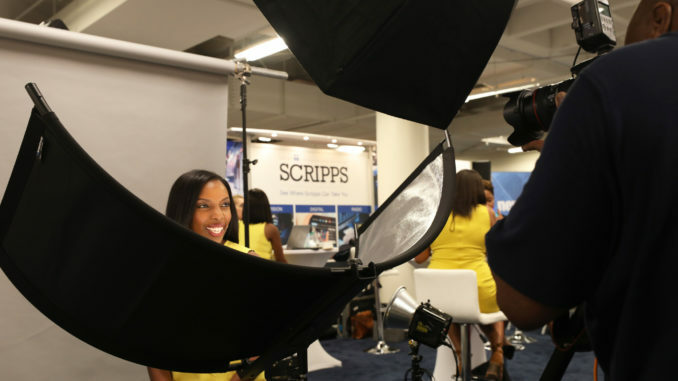 Jobina Forston, reporter for WAVE 3 News receiving complimentary headshots by photographer, Michael Jackson at the 2018 NABJ Convention Career Fair on Thursday, August 2 in Detroit, MI. Photo by Jazmin Goodwin. A joint conference and member program between the National Association of Black Journalists and the National Newspaper Publishers Association may be in the works for the future. The conversation is just the beginning. Glover attended NNPA’s conference in Norfolk, Virginia, a few weeks ago. The NABJ Board of Directors will decide if a partnership is in NABJ’s future. Both NABJ and NNPA hope the partnership will create more advocacy, programming and possibly a convention. Benjamin F. Chavis Jr., the president and CEO of NNPA, is optimistic about the partnership. According to him, the timing is right. “If a partnership is implemented, the joint membership will create more opportunities for black journalists,” Chavis said. “We want to contribute to the empowerment of our communities we serve—the African-American community—economic empowerment, political empowerment and social empowerment,” he said.